Featured Techniques: Using Split Rings to bridge from pattern section to next section, embellishment with beads and buttons using Mock ring technique from Part 1 Lesson optional, additional practice for Split Chain Stitch Join, introducing the use of an SCJ with incorporated picot for future join points. Please review lesson notes from Part 1 for Mock ring with beaded or button in center of ring. We began with Birgit Phelps' Simple Angel to which was added beads on picot joins and beads added to the center of mock rings and skirt fill. Now we look at taking that variation a step further and creating an original doily pattern from the frame work elements of the skirt. First I considered the start point and the direction of the line of progression. The core thread. The Angel's start point is at the center using a true ring. From there the chains led down to base of the skirt. The Simple Angel used a true ring and chain configuration, the Beaded Simple Angel began with a encapsulated chains and SCMR rings for a skirt fill, joining to the beginning chain with the center ring. The skirt was then tatted around and joined to the added filling. Note the difference in beginning methods. The ring center, the fill and the skirt, now becomes the basic repeatable pattern for the panel sections that will make up the doily. Consider the line of progression in doing the repeat. It requires a bridge. A split ring or split chain is often considered for used to climb out to continue. In this case the motif is not worked by round to be climbed out of. Instead the line of progression winds and travels out from the center of the motif back into the center back out and around thus creating the base of the skirt section to "bridge" to the side not "climb" out to an additional round. The use of a split ring brings your threads in position to begin and repeat the skirt pattern in its entirety joining the parallelling chains and rings to each section at the sides. The width of the skirt section will allow the pattern make 5 panels to form an pentagon. 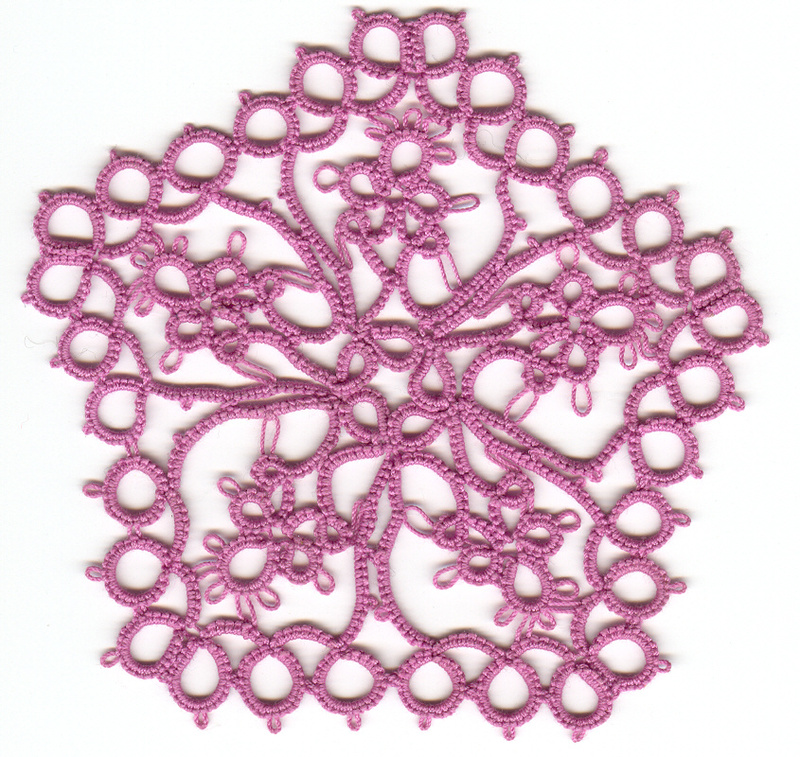 With the techniques outlined in Part 1 this doily can be embellished with beads on picot joins as well as adding beads or buttons in the lower rings of each skirt section. The tatter's choice of embellishment or choice of thread determines the best technique to employ. This pattern is written for true rings, however the tatter may substitute mock rings maintaing the same join points for the rings if need be to accomplish the goal of their project. In addition the notation applying to the use of LHPJ, SCJ and SCJ with incorporated picot has been included in italics to demonstrate for the tatter how stitch count would be affected and where in a pattern the adjustment applies. 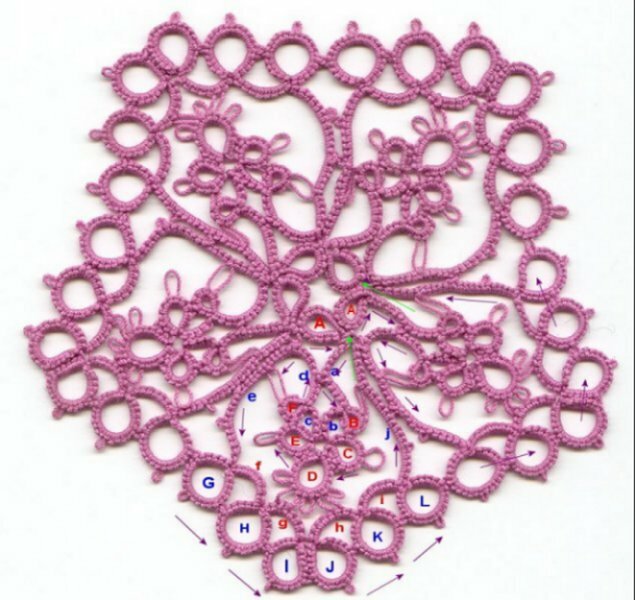 An understanding of this principle helps in converting patterns for the use of these techniques automatically as one is tatting without specific notation provided by an author of a pattern. Then substitute SR 10 / 6 for Ring A: Rep from * to * , 4 times, joining the chain 6's at opposite picots of chain 6's and joining the first to last chain 6's. On 5th panel join SR to first ring picot to close circle of rings in the very center and work the last panel in its entirety and cut, tie and hide ends. You may print this lesson and share it, please give recognition to the designers as noted above.